Canoe paddles come in all kinds of materials. From plastic and aluminium to very high-tech materials such as carbon fibre. 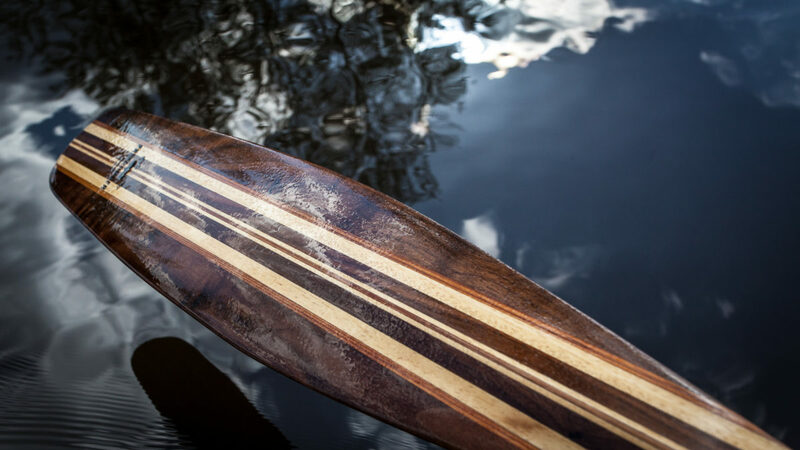 Wood is by far the most popular material for canoe paddles. A wooden paddle is beautiful but also strong and durable. The warm and silky feel of the wood is pleasant to the touch. We offer five different paddles for varying types of paddling. Our paddles with longer, slender blades are ideal for lake cruising or longer expeditions. The wider shorter blades are more suitable for technical paddling on rivers and moving water. For young but discerning paddlers we make a children’s beaver- and ottertail paddle. Laminated wooden paddles retain their shape perfectly because they are made up of different wood strips. Our paddles are made up of carefully selected wood. We use ash, mapple, cherry and walnut to provide the necessary strength. To reduce weight we combine these heavier species with lightweight wood such as cedar and ayous. To guarantee a strong laminate we use epoxy to glue the strips together. The resulting laminate guarantees a waterproof, solid, strong and relatively light combination. Our wooden paddles are available in a satin-gloss varnished and an oiled version. To provide a pleasant and smooth feel the grip is always oiled. Canoe paddles come in all shapes and sizes. We offer six designs in a variety of wood species. Our paddles are made up with a selection of hard and soft woods. The laminate takes the best of the strength, weight, flexibility and beauty of the different woods. 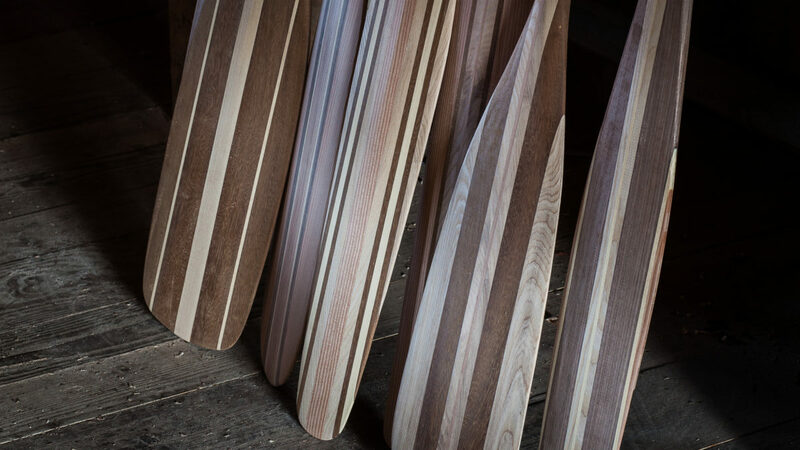 Each canoe paddle is handcrafted in our shop in 5 lengths. They come with an oval shaped shaft to fit your hand. To prevent blisters the grips are unvarnished. They are oiled with double boiled linseed oil. We offer two finishes for the paddles, oiled or varnished. Our Algonquin, beavertail, ottertail and voyageur canoe paddles are traditional designs. They are inspired by the paddles used by the Indian tribes and the fur traders who traveled the rivers of Canada. They often paddled up to 20 hours a day at a stroke rate of 45-60 a minute. To keep up this exhausting pace they used paddles with long slender blades. These slip gradually into the water distributing the pressure evenly. This results in more efficient paddling and less strain on arms, neck and shoulders. 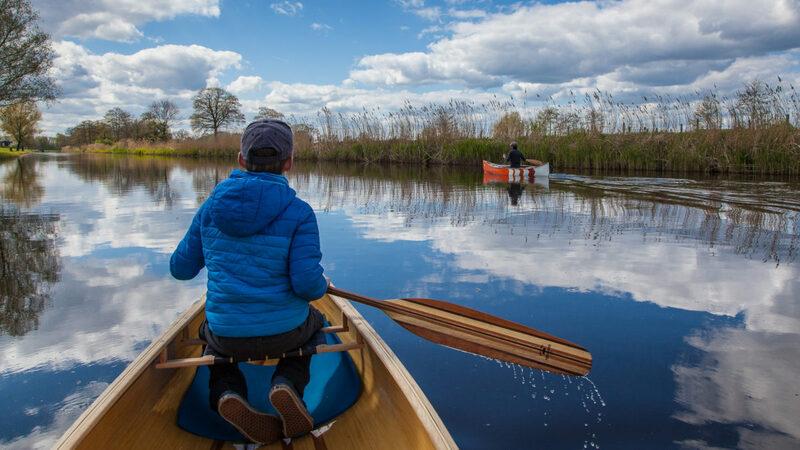 So if you’re looking for a cruising paddle or one for a trekking or an expedition our Algonquin, bevertail, ottertail and voyageur canoe paddles are the way to go. If you’re looking for a paddle where acceleration power and quick steering are important you have to look for a wider blade. Our Sugar Island and whitewater paddles are designed for moving water where getting in and out of eddies and bracing are essential. Our whitewater paddle comes with a T-grip for even greater control. Your wooden paddle does not require much maintenance if you take care of it between trips and repair any damage. Wipe of dirt before storing and always keep it in a dry place. We clean our oiled paddles after each trip with a Scotchbrite pad and give it a new layer of double boiled linseed oil. It takes 5 minutes of work to keep your paddle in top condition. • When the second layer is dry your paddle is ready. If the wood is damaged, sand the affected area with 100 grit sanding paper and apply 4 layers of varnish. If the damage is greater we will fix the paddle for you for a small fee.